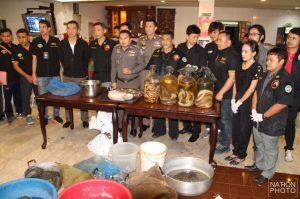 A contingent of 20 police led by 191 chief Surachet Hakpan and wildlife protection authorities raided a Chinese restaurant in Bangkok yesterday. On the ground floor at “Luang Toto” in Sriwara Road they found a cobra prepared for dining and a couple of hungry customers about to tuck in. Upstairs they found endangered snake species and creatures in jars that Chinese people like to eat for various imagined health benefits. And more yummy cobras in other parts of the restaurant were found on the second and third floors. Out back they found several ponds containing live animals. Manager Jamoo Sae-yee, 66, from Chiang Rai and six Burmese workers were taken to the Wang Thong Lan police station for questioning, said Bangkok Biz News. 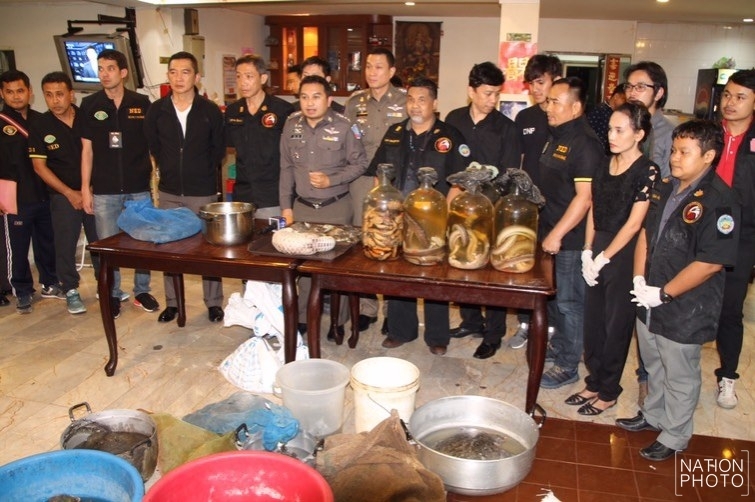 Reporting on the raid on Facebook Thai Rath said that one of the endangered species destined for the table was the Asiatic soft shelled turtle. Grannie takes matters into her own hands – in this case two huge pythons!